Cunard’s Queen Victoria sailed away from Southampton earlier this week under a canopy of fireworks celebrating the start of her world cruise in Cunard’s 175th anniversary year. Passengers aboard Queen Victoria are enjoying a refurbished ship just back from a 20-day refit at Blohm+Voss in Hamburg, updating the ship with many of the features recently added to Queen Elizabeth. In this video, can see just how it was done - in Cunard style. The complete article appeared in the January 23 edition of Cruise News Daily. If you’ve sailed aboard Carnival Breeze or Carnival Freedom recently, you got a chance to try a new service Carnival was testing called the Carnival Mobile Casino. It’s an app that runs on your smart phone or tablet and lets you play casino games for real money - legally, any time the ship is in international waters anywhere on the ship. Details appeared in the January 23 edition of Cruise News Daily. Carnival Cruise Line showed off Carnival Vista this afternoon at a media event in New York, and in a breath of fresh air, they returned to the days of unleashing the entire product instead of letting features dribble out one by one in an endless series of live webcasts or press releases. Carnival has apparently realized the public loses interest fast. They collected all their hype and let it explode today. There are lots of good features. We can say that with confidence because Carnival has used many of them on other ships, and they’ve evolved them for Carnival Vista. Almost all the ones that aren’t coming from Carnival ships, however, are coming from some other cruise line’s ships. The complete article appeared in the January 22 edition of Cruise News Daily. Beginning this year, Windstar will be providing passengers on each of their cruises worldwide with a Private Event. In the Caribbean, it will be an Island Experience, designed to give passengers the feeling of having their own private island for the day. The inaugural Island Experience will come at the end of the month on Prickly Pear Beach in the British Virgin Islands, and it will have a special host. The complete article appeared in the January 21 edition of Cruise News Daily. 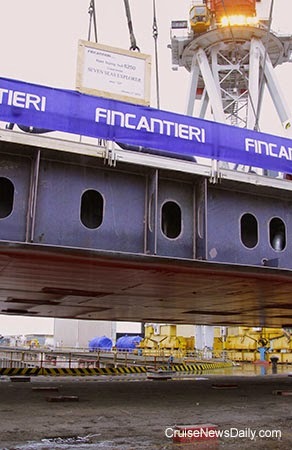 This morning Fincantieri put the first block in place for Regent's Seven Seas Explorer at their Sestri Ponente yard. Delivery of the 56,000-gross ton ship is set for the summer of 2016. Details appeared in the January 21 edition of Cruise News Daily. Photo courtesy of Regent Seven Seas Cruises. All rights reserved. May not be copied or used without permission. Seattle, Wash., Jan. 21, 2015 — Beth Bodensteiner has been promoted to senior vice president, revenue management for Holland America Line. In this capacity, Bodensteiner will lead the development and execution of all revenue management programs and initiatives that support Holland America Line’s revenue goals. She will report directly to Orlando Ashford, president of Holland America Line. Bodensteiner previously was Holland America Line’s vice president of revenue management and product marketing. Prior to that she was director, cruise marketing for voyages, as well as director, cruise marketing for Caribbean and North America. Before joining Holland America Line in 2003 in the marketing department, Bodensteiner worked as a program manager with Zebra Hill Marketing in Bellevue, Wash. She holds a bachelor of arts in English from the University of Washington.